Sunday dinner features chicken more often than not. This afternoon I watched The Hundred-Foot Journey, a movie starring Manish Dayal which tells the story of an East Indian start-up restaurant right across the street (exactly One Hundred Feet) from a Michelin-starred French restaurant owned and operated by Helen Mirren. A cute movie that made me want to cook some delicious Indian food right then, even though I don’t have a clue how to do it, nor do I have their amazing spices. 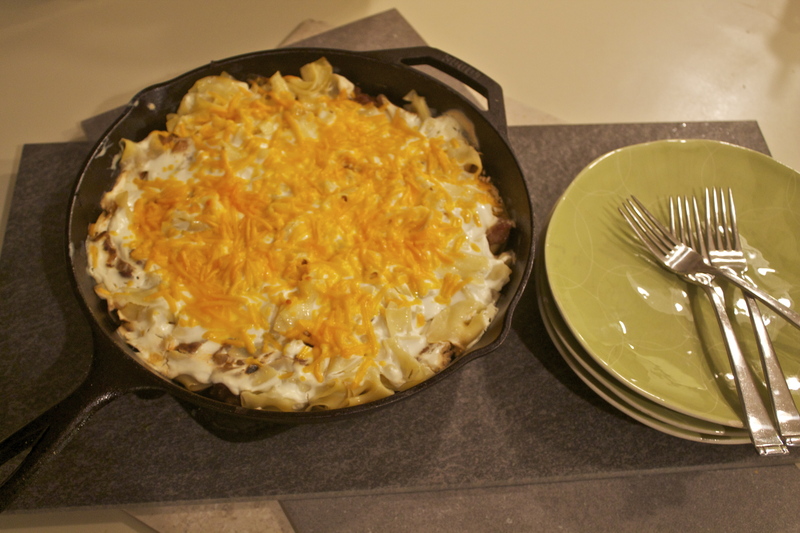 It did motivate me enough to get off the couch and make something traditional and tasty for Sunday dinner. And yet….I have a feeling there will be Indian cooking lessons in my future! On medium high heat, add olive oil to non-stick frying pan and place the chicken backside down first with fleshy part upright. Lightly salt and pepper the chicken while in the pan. Brown and turn chicken over and brown on other side after 4 minutes. Once fully browned, remove to a plate and cover with tin foil. Add 1 Tbl of butter to pan. 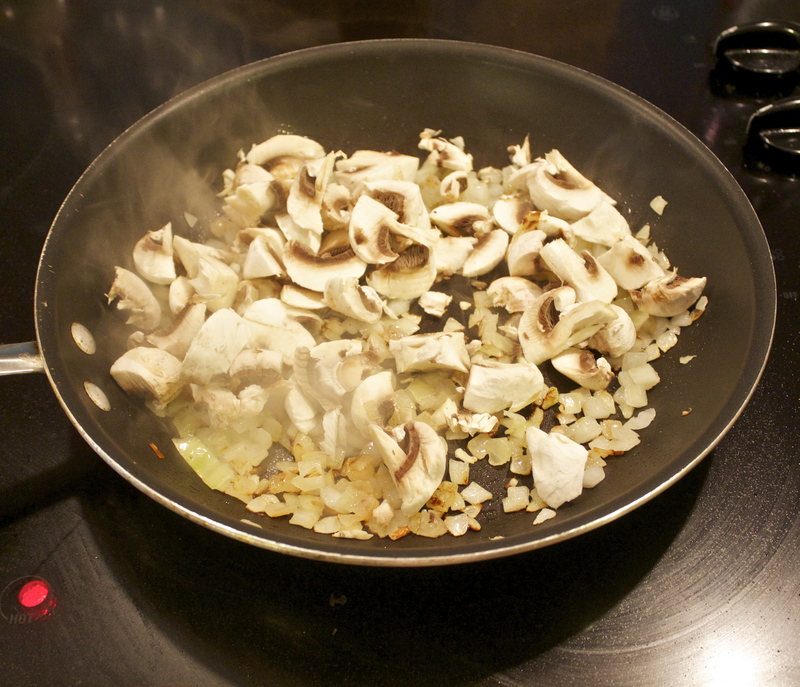 Trim and clean mushrooms; slice and add to frying pan along with minced garlic. 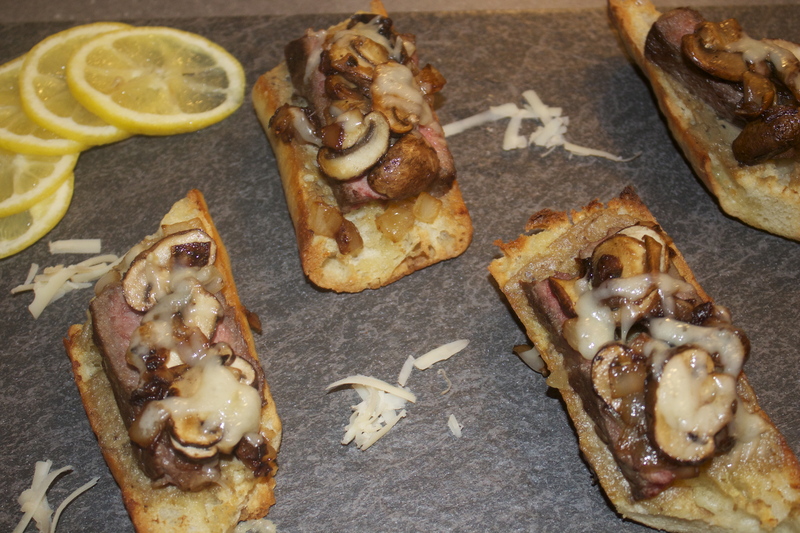 Over medium heat, brown the mushrooms – about 8 minutes. Turn up heat to high and add the chicken stock – bring to boil and then turn back down to medium heat. Mix 1 Tbl of soft butter and 1 Tbl of flour (called a slurry) and add slurry to the sauce (whisk so no lumps form). Add a smidge of salt to the sauce. 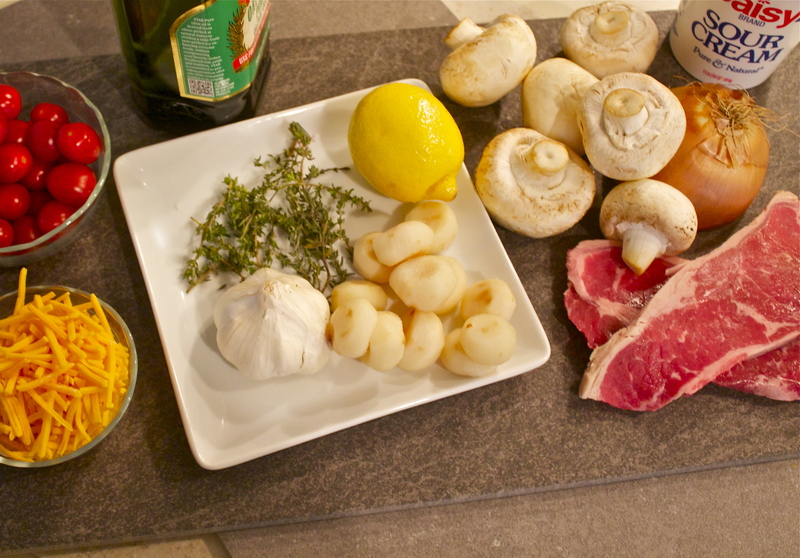 Take sauce off the burner and add the Cognac – blend into the sauce. Place chicken on top of sauce and put in oven for 15-20 minutes or until the chicken reaches 180 degrees. 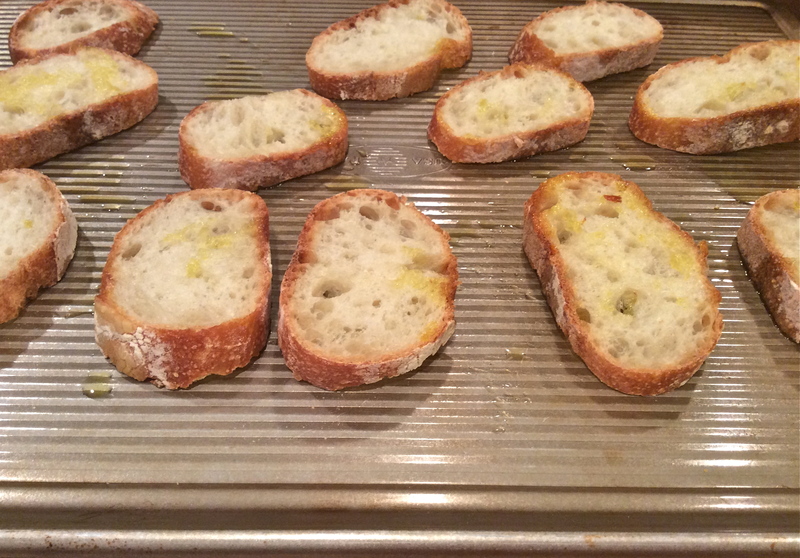 Remove from oven and add 1 Tbl of butter on top of dish for richness – Serve! 1. Butter the sides and bottom of a souffle dish. 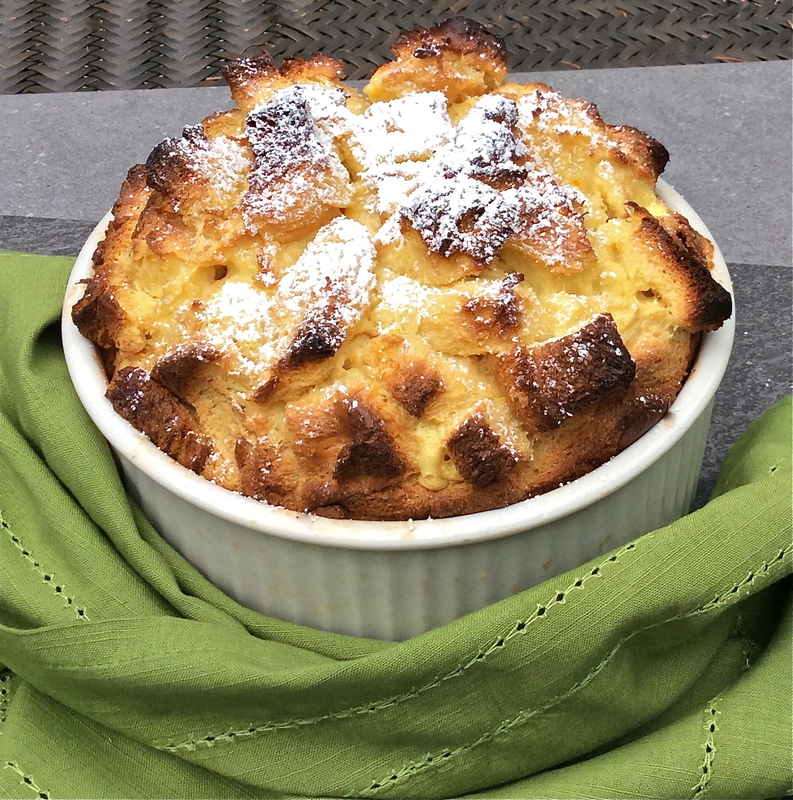 Take day old bread and cut into 1″ squares and add to the souffle dish. 2 . Combine milk, sugar, eggs, vanilla, spices, pinch of Kosher salt, and the Grand Marnier. Whisk till thoroughly combined. 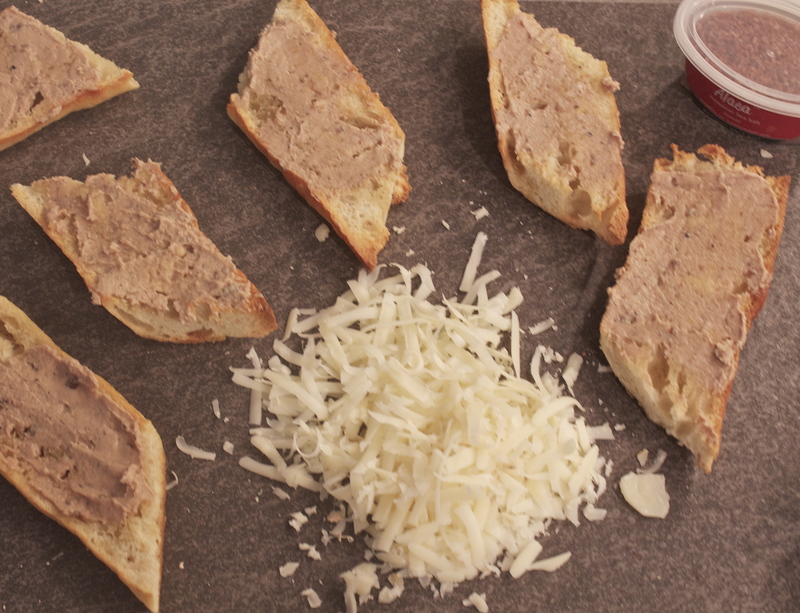 Pour this mixture over the bread cubes and cover with plastic wrap and refrigerate for 4-6 hours. 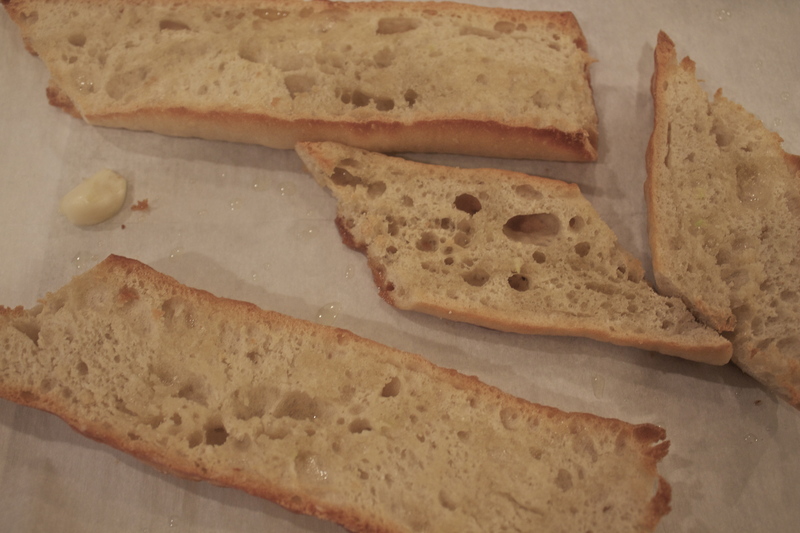 Remove bread mixture from the refrigerator and let sit out for about 30 minutes. 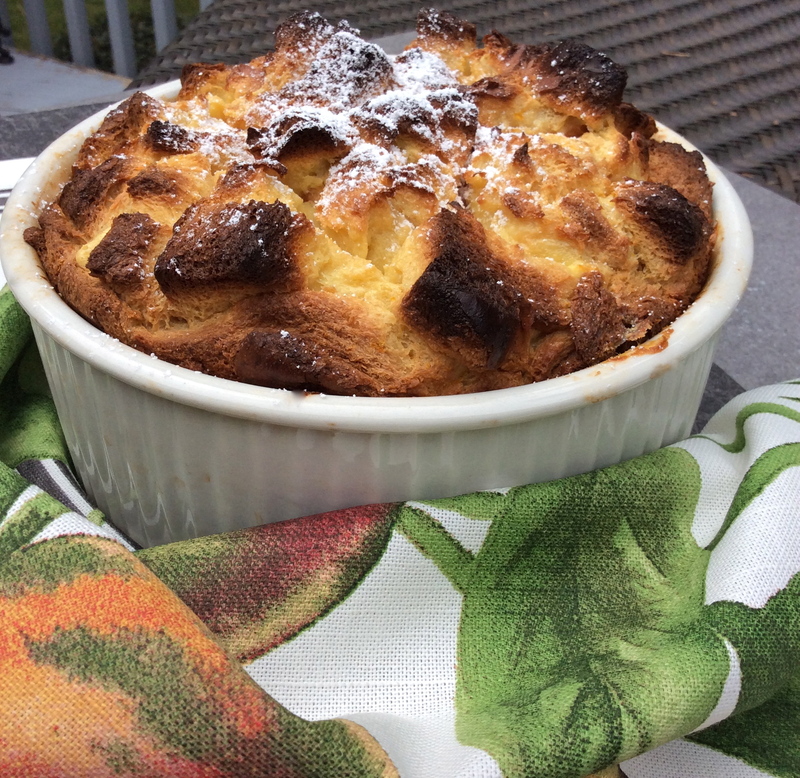 Place bread pudding in oven and cook for 30-45 minutes. The pudding is done when it starts to rise and the top and edges get brown. Sprinkle powdered sugar on top and serve with some freshly whipped cream. Now go cuddle up in your favorite chair and start that book that has sat on your night stand for a month! Filet Mignon, considered the king of steaks and once relegated as a cut of beef only consumed on special occasions because of price, has now crossed over to the “healthy” side of beef and consumed in larger quantities by steak lovers, since it has little to no visible fat. 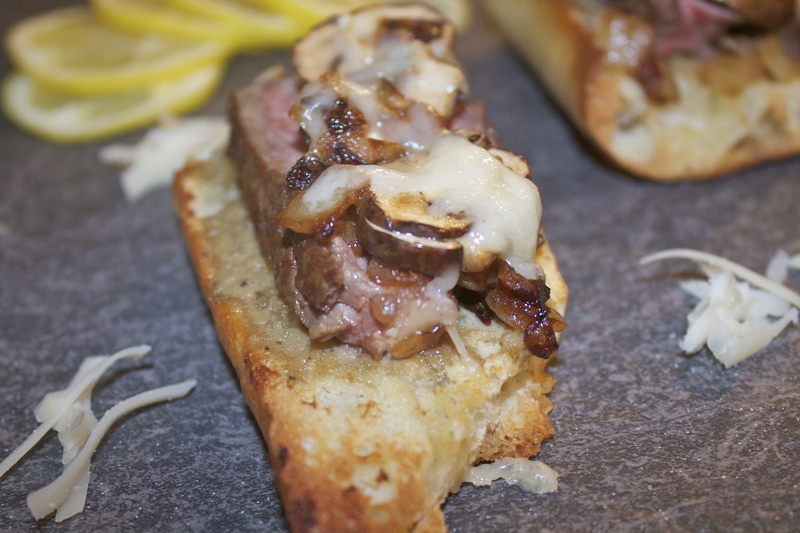 It is the most tender steak you can buy, but unfortunately not always the most flavorful. Because of that I have moved up the flavor a couple of notches by adding the herb butter buttons on top, along with a slight hint of Rosemary at the end. Makes for a flavorful and tender bite! 1. 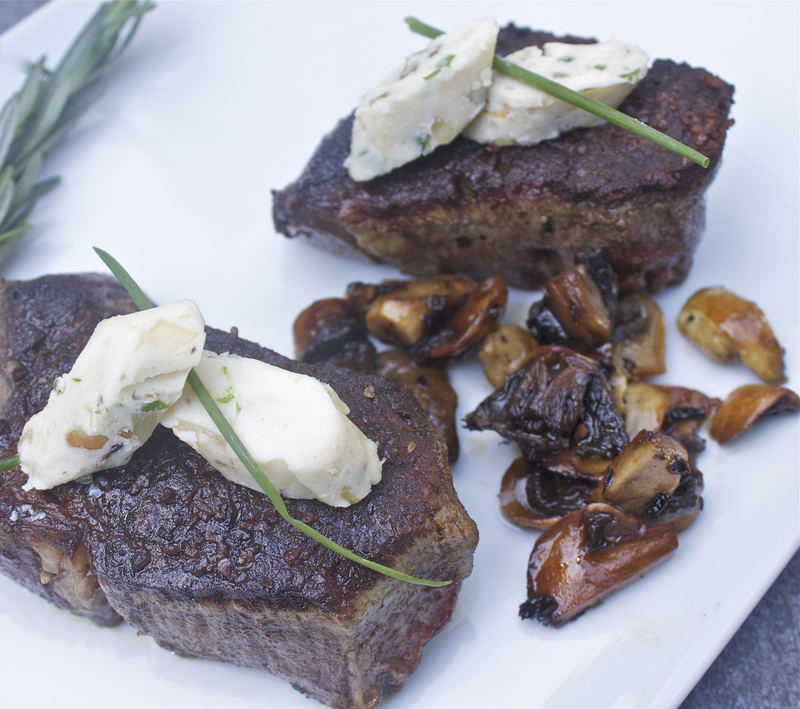 Take filet steaks from refrigerator and let them sit out for about 20 minutes – heat oven to 400 degrees at same time. 2. Remove skins from shallots and garlic and put in a garlic cooker or tin foil and pour olive oil on top – put in oven 20-30 minutes till golden brown and mushy. 2. Butter buttons: Cream the cube of butter, add a dash of Hawaiian salt (or Kosher Salt), chopped chives, and the cooked garlic and shallots. Using a piece of parchment paper, lay out the butter and slowly roll it jelly roll style – then put in freezer for about 20 minutes. 3. Wipe the steaks of all moisture and rub both sides of the steaks with Hawaiian Salt. Add olive oil to a frying pan, add the steaks and grill for about 3 minutes. Turn over and cook another 2 minutes on the other side. 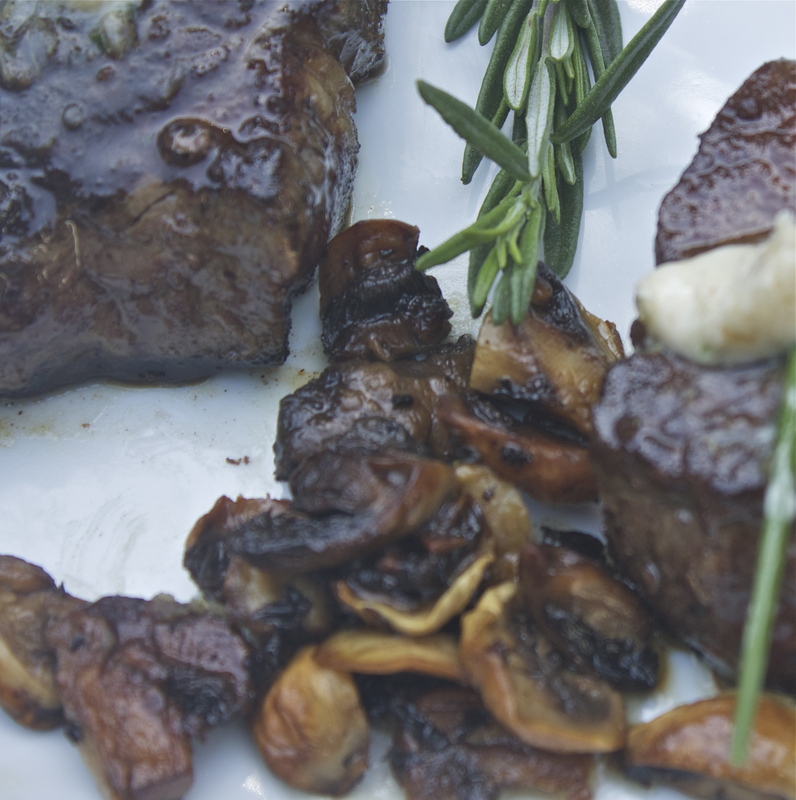 Add two sprigs of Rosemary to the pan and place in the oven for 3-5 minutes depending upon the doneness you want. 4. 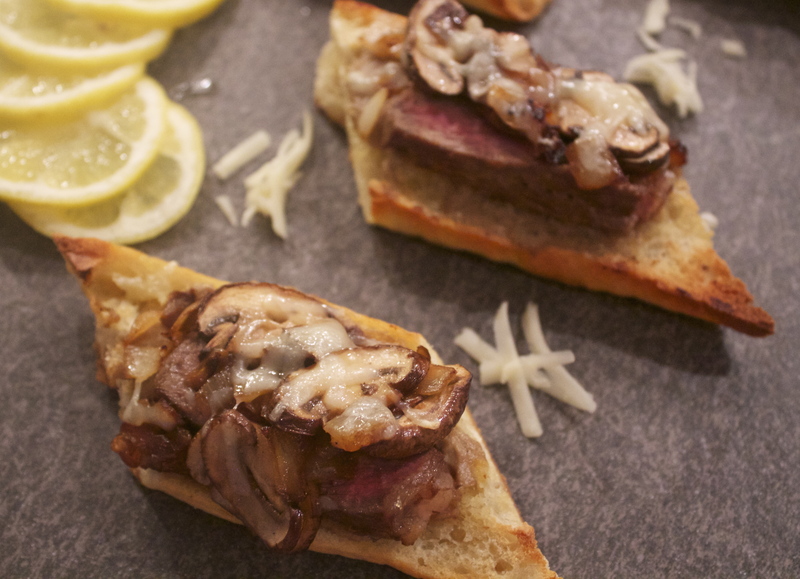 Plate the filets, top with the herb butter buttons and shallots/garlic on the side and serve! I found a new cooking pal this week Tiffani Thiessen, on the Cooking Channel’s “Dinner at Tiffani’s”, her new show. You probably remember her from the 90’s sitcom, Saved by the Bell. Well she is all grown up, married with a 5-year-old daughter and another one on the way. And she is gorgeous, as is her husband Brady Smith. She invites celebrity friends over for dinner and they catch up in the kitchen as friends do while cooking. Most of the cooking is done by Tiffani, but then it’s her show and she is the chef. And a pretty good chef at that. I did a little half-day “marathon” and watched all five episodes so far and cooked at least one recipe from each show, which is something I have not done before. But, you kinda feel you have to when you see her recipes and realize you can cook something great in a short period of time. Her food looks amazing and when she and her friends sit down to eat, you really, really, really wish you were there eating too – it looks that Yummy! I am having friends over later in the month so decided to try out her Roasted Acorn Squash with Spicy Maple Glaze. I adapted it a bit (no Bourbon for me, but Cognac works, and I added some chives and chopped bits of bacon as that is how we had it as kids). This took less than 10 minutes to prepare and then you are ready to serve a yummy vegetable for family and friends. 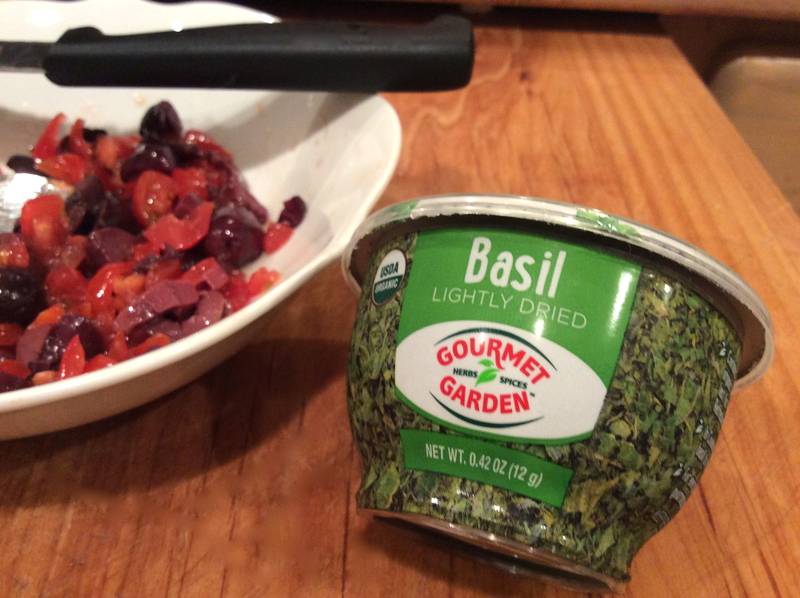 Try this, it’s really tasty! 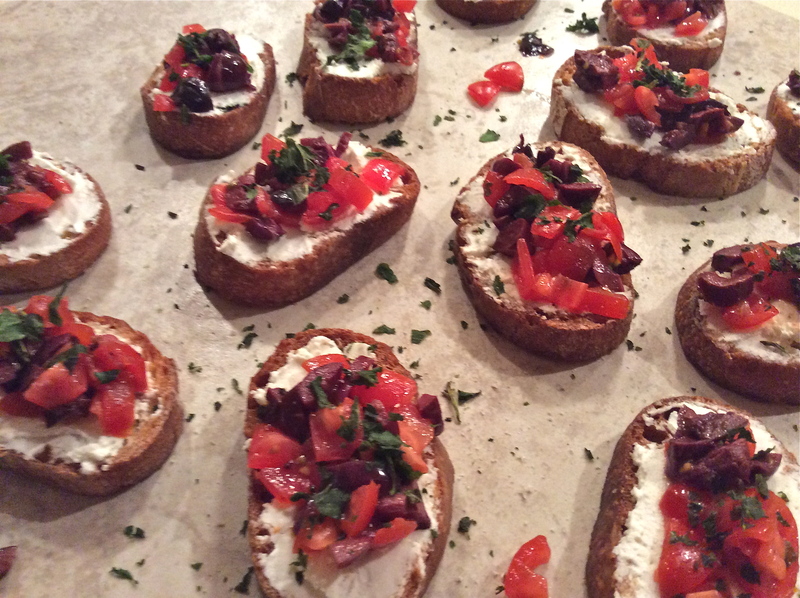 And check out Dinner at Tiffani’s when you get a chance – you will love it! 1. Wash and dry acorn squash. Heat oven to 425 degrees. Cut squash in half, then halves into quarter, then quarter again, so you get half-moon circles. 2. 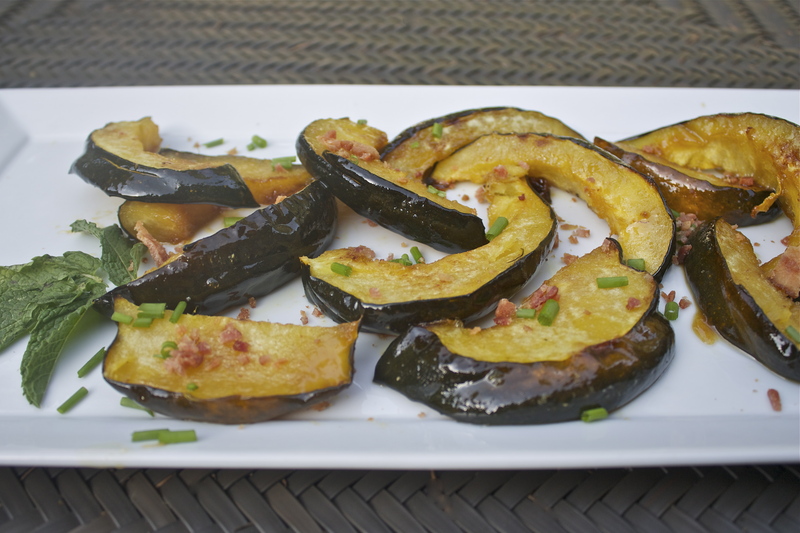 Place parchment paper on a sheet pan and lay down your squash wedges. Lightly pour olive oil on the squash and move around till well covered. Add onion powder and Kosher salt then add to oven and roast for 20 minutes. 3. On stove top add maple syrup, butter, brown sugar, and bring to a boil then turn down to low immediately. 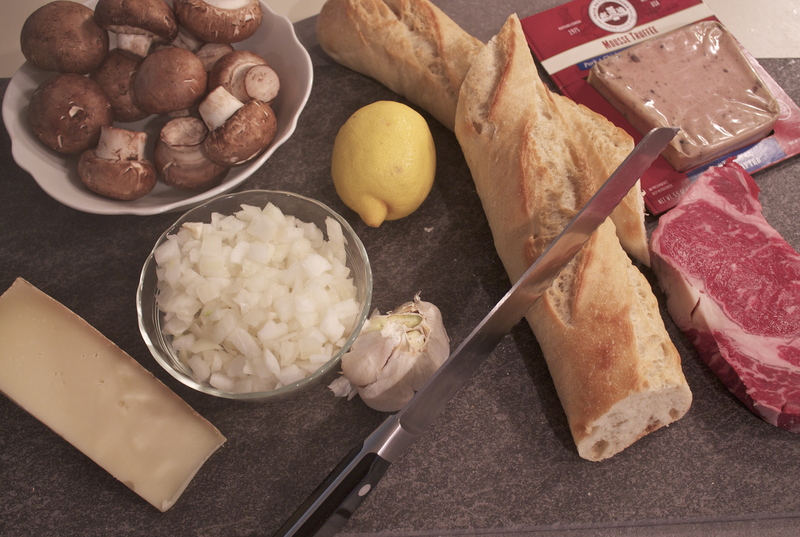 Add Cognac carefully and let the alcohol cook off – set aside. 4. Chop the crisp bacon into bits and chop the chives. 5. 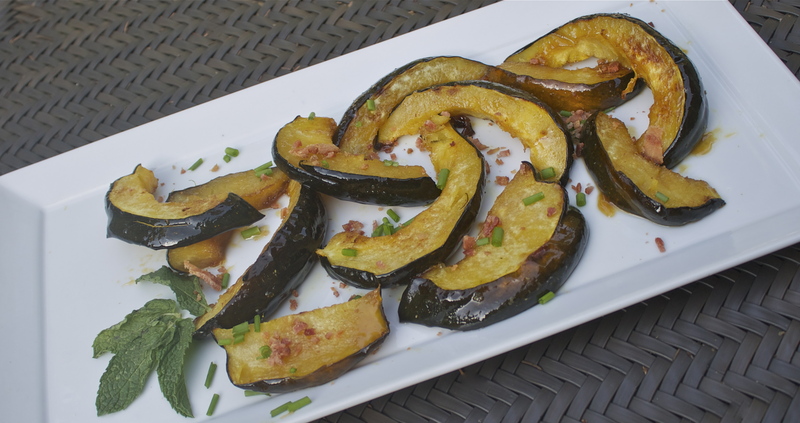 Take out the acorn squash and paint with the Cognac glaze then put back in oven for 10 minutes. Take out and turn over and baste the other side and back in oven for last 10 minutes. 6. 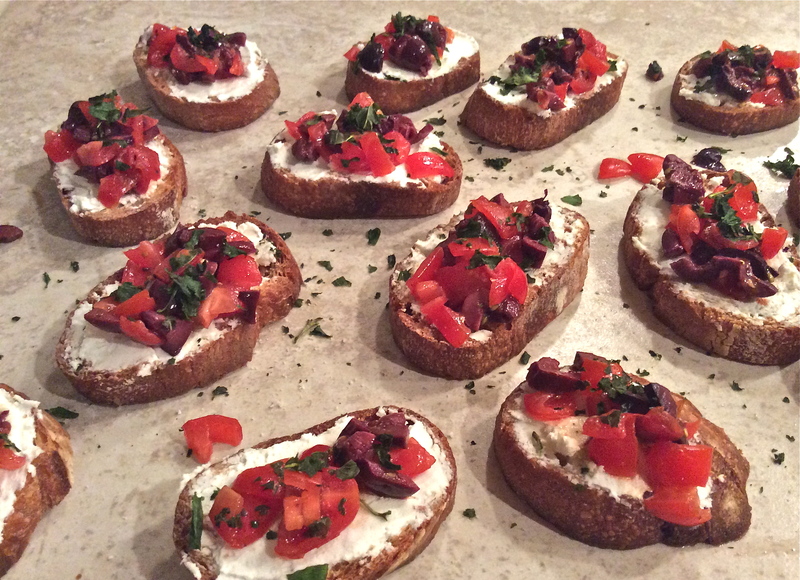 Plate the acorn wedges on a plate and sprinkle chopped chives and bacon on top and Serve!